Right now, so many beautiful plants, animals, and humans in California are being threatened by conditions created from deadly wildfires. Heart grief, anxiety, and dirty, smoky air are both emotionally and physically taxing. If you’re living with the consequences of those fires, my love goes out to you. It’s important to take care of yourself — and others, if you’re in so fortunate a position — so I wanted to share some herbs that can be deeply healing for our lungs, our toxin-elimination systems, and our minds & spirits. Some of these herbs are easily found in commercial teas, while others can be purchased loose online. A few of these will be found right in the backyards of Californians. Mullein: Mullein is one of our greatest lung & respiratory allies. Towering, yellow-flower-laden mullein has historically been used for torches — and it often grows wild after forest fires — so in the great, mystical balance of the plant world, this herb shows us its harmonic uses: mullein is both a giver of fire & a healer of fire’s harms. It’s an expectorant (expellant) and a demulcent (soother), and it can be taken as a tincture (steeped in strong alcohol to remove active medicinal constituents), in capsules, or as tea. Be sure to strain the tea through a cloth (like an old, clean t-shirt) to remove the fine, irritating hairs from the leaves. Licorice: Not only is licorice calming and clearing for the throat and respiratory system, but it also supports fatigued adrenals. Like mullein, it expectorates and soothes, so it is a wonderful addition to wildfire self-care. It’s also a gentle blood cleanser & helps to detoxify the overtaxed liver. It can be taken as capsules or taken as tea; it can also be added to other, more bitter herbs to sweeten them. Please note that licorice is contraindicated in larger doses for anyone with a heart condition or who retains excessive water. Marshmallow & Slippery Elm: Beautifully cooling demulcents, marshmallow and slippery elm both calm inflammation and create a protective barrier for delicate mucous membranes. They alleviate dryness and soothe sore throats & the digestive tract. Both can be taken as tea. Slippery elm is also a wonderful, ancient food. Store-bought slippery elm capsules can be opened and mixed with water to create a sweet, tasty gruel that you can add to foods or eat alone. Oftentimes, it is one of the most gentle ways to get an inappetent person some sustenance. Eucalyptus: A facial steam from eucalyptus leaves can help moisten, clean, and clear an inflamed, irritated respiratory system. Put chopped leaves in a bowl of freshly boiled water and place a towel over your head to receive the steam or take a sprig of eucalyptus into the shower or bath with you. A few fresh leaves from the hillside can even just be crushed under your nose or rubbed on the chest or against other taxed areas of the body to aid in healing. 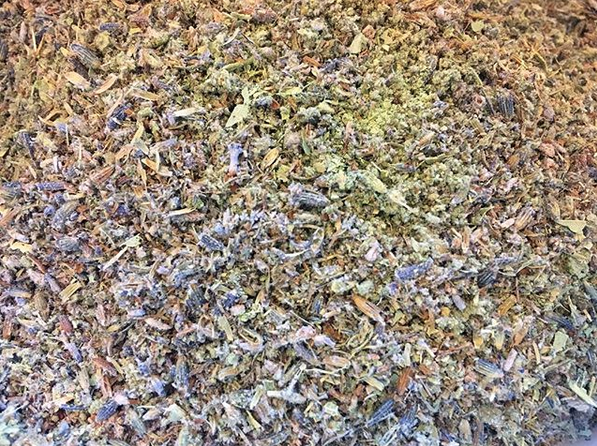 Finally, to support and ease the stress of your nervous system, try hops, chamomile, catnip, and lavender. All can be taken as tea or dropped into a bath (especially for children). Overall, avoid foods and activities that alarm the body, like sugar, alcohol, smoking, dairy, and so on. Eat lots of antioxidants and liver-supporting foods. Aim for dark colors, like berries, and leafy greens like dandelion or beet. Cook with aromatic herbs — most of these herbs have profound healing qualities in addition to their taste. They grow along side us and appeal to our senses to show us their deeper medicine. Drink lots of water, rest, breathe through your nose, and wear a respirator or mask if you can. Take a moment to consciously connect to the land and its beings around you — we are all experiencing the same things. Put your hand on a plant, close your eyes, say a prayer if you want, and let that being be an ally to you, to comfort you, and to remind you that we are all truly safe. Take care of yourself. Rest. Share this information if it can help someone, and remember that everything is going to be okay.